Ranked 37th in global retail sales, the IKEA brand clearly outpaces the size of its activity. Most people are familiar with the famous blue and yellow stores, emphasizing the Swedish origins of the company, and have personally experienced the company’s iconic business model based on self-service and flat shipping. 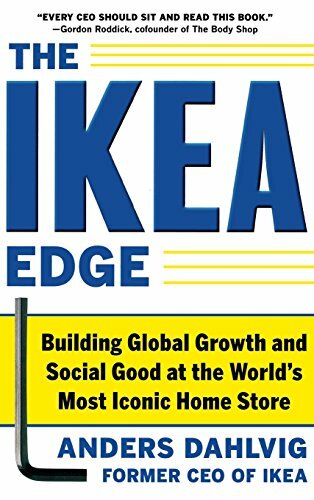 However, readers ofThe IKEA Edge by former CEO Anders Dahlvig may be surprised to learn that the business model dates to the 1950s and 1960s, long before most of the world ever heard of IKEA. It is a testament to founder Ingvar Kamprad’s patience and consistency that he expanded beyond the borders of Sweden only when he thought the company was ready. In fact, Kamprad waited nearly two decades before even expanding beyond the small town in which he had opened his small furniture store in 1949. Only in 1965 would he open a large Stockholm store that featured the now-renowned IKEA self-serve business model. 1. A vision with a social ambition combined with a strong value base. IKEA was one of the first proponents of the idea that a company’s social obligation strengthens its business. 2. A business model in which product range and price are the main differentiators. According to Dahlvig, achieving this differentiation requires controlling the entire value chain from product development to retail outlets. 3. A global portfolio of markets that fulfills the company’s short- and long-term goals. The stability of mature markets balances the risk of growth markets. 4. Control of the company by a committed owner. IKEA is one of the largest privately owned companies in the world. Perhaps one of the underappreciated keys to the success of IKEA, a company known for design and innovative business practices, is its discipline and consistency. Kamprad began a Swedish furniture retailer in 1949 and 60 years later, IKEA is still identified as a furniture retailer from Sweden. Its flat shipping concept dates from 1953, and, as mentioned above, the self-serve concept was introduced in 1965. Despite opportunities to broaden its product range, IKEA has remained loyal to its focus on home furnishings and nothing more. While staying true to its business model and values, IKEA also knows when to adapt. In the 1990s, for example, the company broke two of its rules on sourcing: owning the means of production and having too large a share of a suppliers production. Reversing its earlier positions, IKEA bought a manufacturer and reduced the number of suppliers. The risk was worth the rewards of lower prices and better logistics, productivity and quantity control, Dahlvig writes. The IKEA Edge is packed with lessons on doing well by doing good. It reveals how to move from an entrepreneurial small company to a global giant. It features great tips on supply chains, corporate communication, integration and innovation. IKEA is not perfect, as Dahlvig writes, but it has earned its success and is a model to be followed.